I wanted Italian Cream Cake… but I wanted strawberries, too. I don’t know why it is but I associate strawberry desserts with Mother’s Day. Maybe it is the white-pink-red theme that just looks feminine? 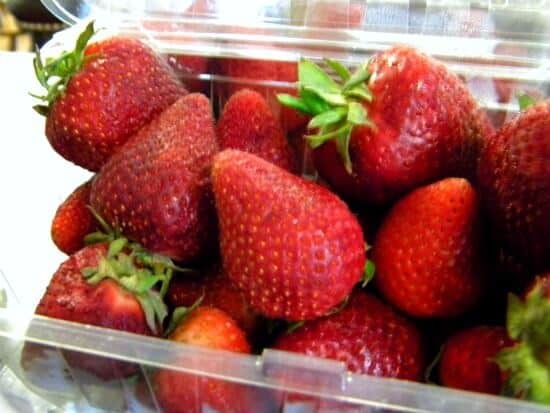 Maybe it is the fact that the berries come into season about the same time as Mother’s Day hits? I don’t know. It is one of those things that I think about in the middle of the night when I can’t sleep. This cake is… FABULOUS. Perfect for Mother’s Day or any other celebration, including the fact that you got through the day without harming your teenager. If you don’t have a teenager that might sound appalling but if you do – well you certainly understand. I have 3 teens right now and a 12 and a half year old, so I know what I am talking about. The fact that I can put two words together in a clearly written sentence is nothing short of miraculous. This Italian cream cake has an intense vanilla flavor with a touch of tangy cream cheese frosting. I added sliced strawberries between the layers and then chilled it for several hours. During that time the berries get a little juicy and the filling soaks it up a little. Let it warm up to room temperature before serving and the flavor is just incredible. Bright and fresh from the berries, tangy from the frosting, and rich and sweet from the cake. I really want to try a version of this with blackberries but the strawberries were on sale and absolutely perfect, as you can see. There are sort of a lot of steps to make this particular Italian cream cake but it is easier than it looks. Trust me. Set everything out about an hour ahead of time to bring it to room temperature. 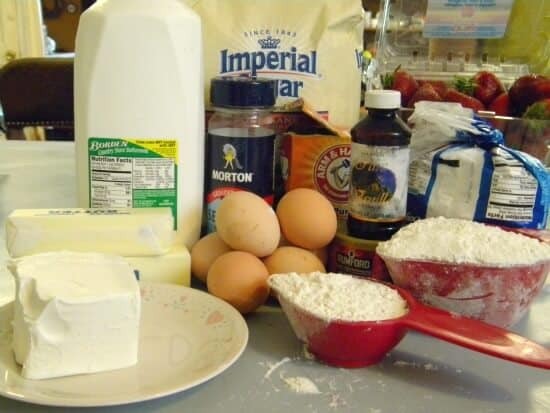 It will make the cake lighter and fluffier – don’t skip this step. You will separate the eggs when they are cold but let them come to room temperature for the best results. 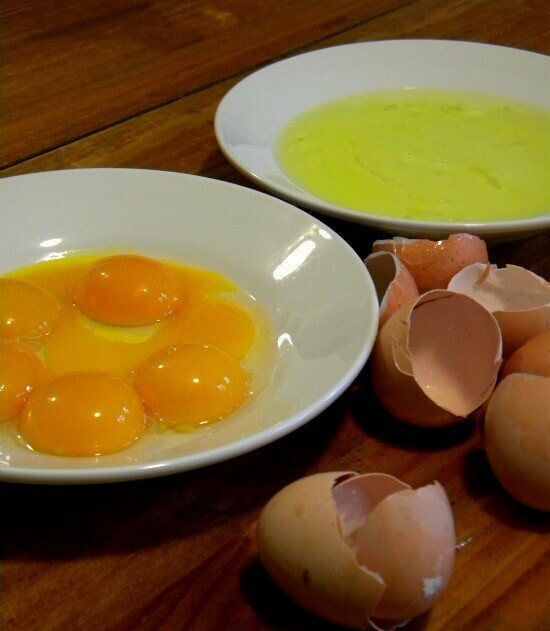 See the yolks? That’s the benefit of having chickens right here… deep orangey yellow and it produces a rich crumb in the cake. Lucky me! 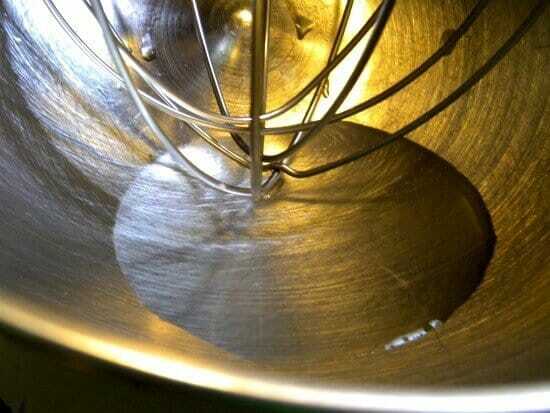 Another little trick I have is to rinse the clean mixer bowl and whips with vinegar. The acidity left in the bowl and on the whip helps the whites beat up much higher – and if there was any fat clinging to the whip it will be rinsed off by the acids. Don’t start adding the sugar into the egg whites until they have come to soft peaks. You risk deflating them if you do. Deflating egg whites is not a good thing in this cake. 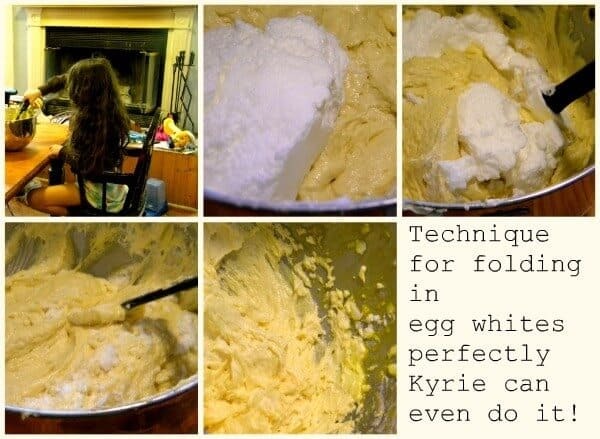 Set the egg whites aside (put them in another bowl gently if you need to) and begin the butter mixture part. You are going to cream the butter, vanilla, sugar, and salt. 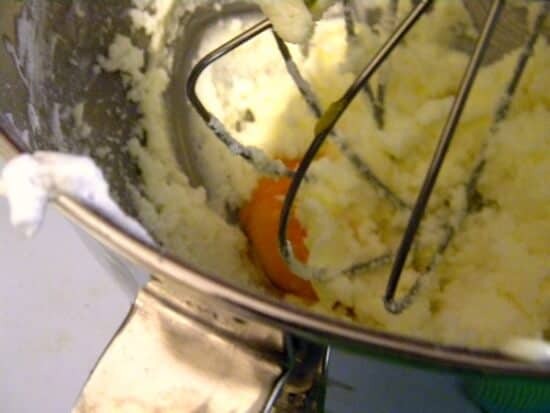 Once they are well mixed you will be adding hte egg yolks one at a time and beating until the mixture is the consistency of a good whipped cream. 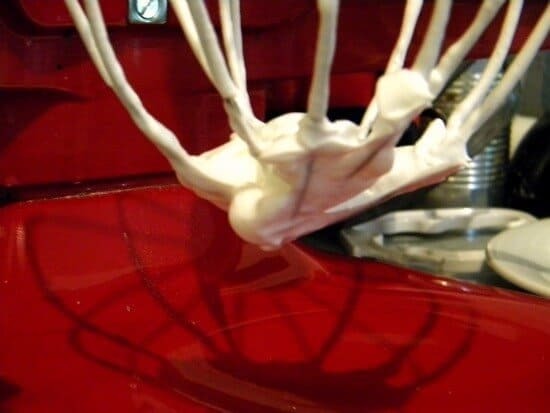 It isn’t difficult to fold egg whites into a batter but you have to be gentle. 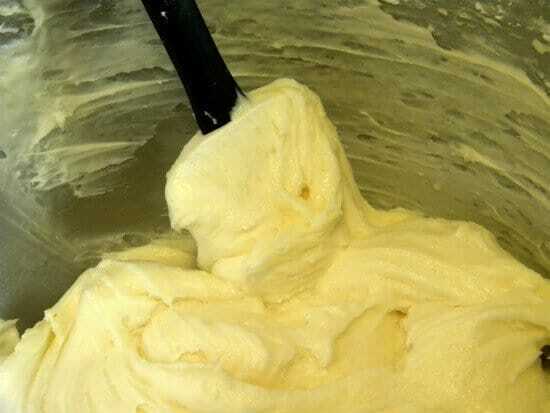 Put about a third of the egg whites on the batter and then gently pull the batter over the egg white. continue to do this until the first third is mixed in. Now, do the same thing with the rest of the egg whites. 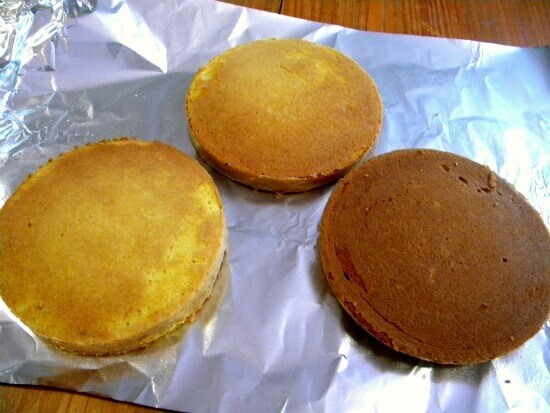 This will help keep them from deflating and it will keep your cake lighter and higher. Just remember to be gentle! 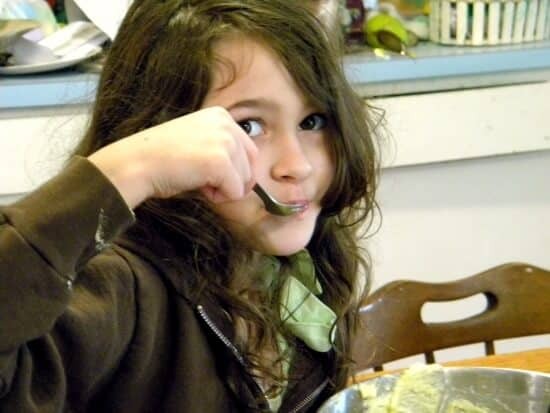 Have your pans buttered and floured and spoon the batter in lightly. Bake at 325 F for 40 minutes or until done. 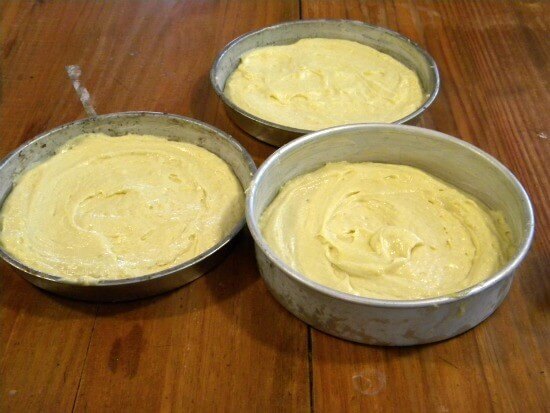 Baking at this low temperature ensures that your cakes are moist. Let them stand for 5 minutes before turning out of the pan. Let the cake cool completely before filling and frosting with the cream cheese and berries. Be sure to reward any helpers that you may have had…. You will need to slice the berries so that they lie flat on the filling. Spread the bottom layer with frosting. Lay the berries on evenly and then add the next layer. Repeat. 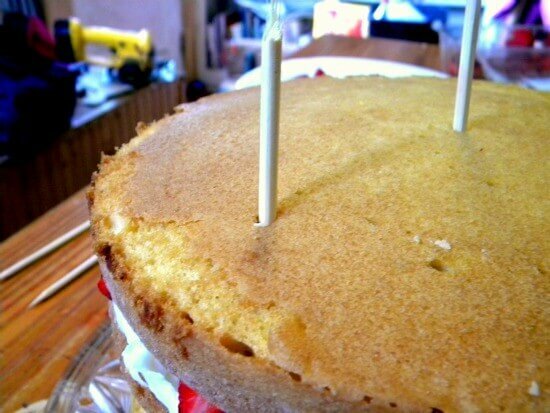 Once you have the Italian cream cake layers put together poke a few straws or wooden skewers down through the layers to stabilize the cake while you frost it. You will be taking these out before you serve the cake but it is a real help when you want to keep your cake from sliding around. This Italian Cream Cake is so good, you just have to make it! 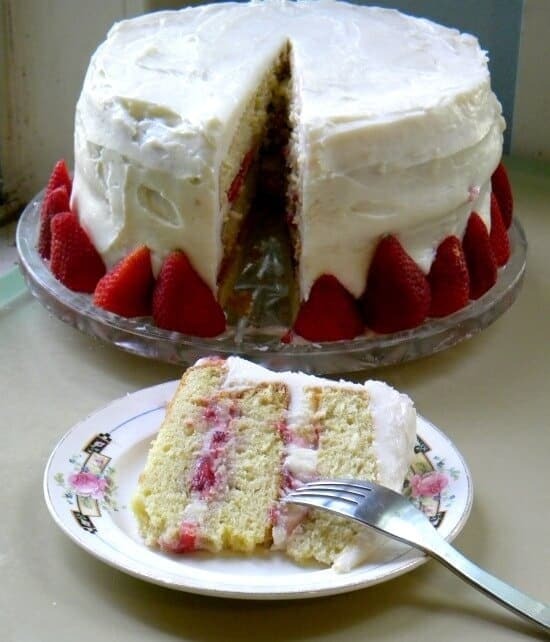 An easy Italian Cream Cake recipe with Cream Cheese Frosting and strawberries is the perfect dessert for Mother's Day or any Spring celebration. 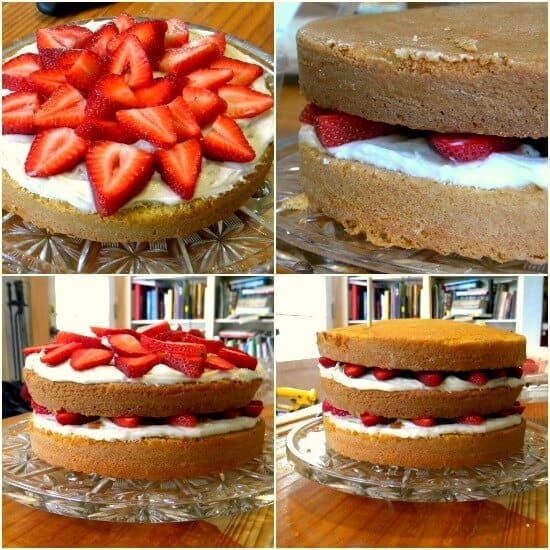 Place a layer of sliced strawberries on the cream cheese and top with another cake layer. « What Is a Misto Olive Oil Sprayer, Anyway? This cake is ridiculous in its deliciousness. Wow. That looks stunning! I know what I’m asking for on Mother’s Day now. Yum, yum, yum! Yep… it was so good! I love fresh berries. 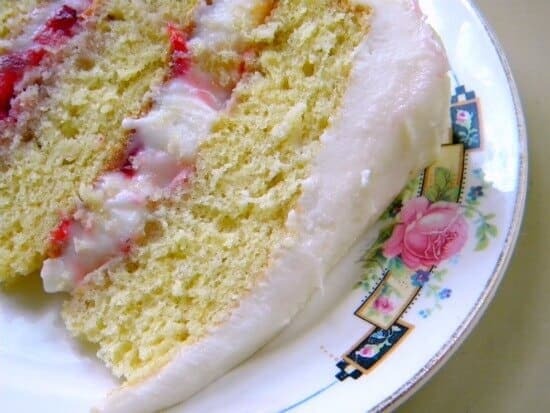 An Italian cream cake sounds fabulous, and even better with fresh strawberries. Vinegar on the mixing bowl and whips, huh? Never would have guessed it in million years. Great tip Marye. I would do that and anything else you recommended to get a cake this gorgeous and beautiful There’s something about strawberries and cream that is fabulous. What a lovely cake! I want a slice for breakfast! What a gorgeous cake! And the buttermilk layers and the frosting sound particularly scrumptious. So pretty! And love the skewer tip for frosting and covering, genius! I love the addition of strawberries to lighten this up. It looks absolutely fabulous! Oh goodness I LOVE this cake! Full of strawberries and cream and goodness… nom. Well done! first, the cake looks absolutely delicious, but I also love your skewer trick for holding it still while you frost – that is genius!! Thanks! I hate trying to frost a slidy cake! I feel the same about strawberries and Mother’s Day…must be the season! This cake is so stunning, I love the layers. Such a pretty cake! I love Italian Cream Cakes and know I would love it even more with strawberries. Pinning! I made this last night for the office and brought it in today. WOW!!!!!!!! Even the non-sweet eaters ate it and went back for seconds!! It is amazing and a beautiful presentation as well. Thanks for stopping by, Joy. This looks like a perfect spring dessert. I know my mom would love to have a cake like this for mother’s day! Thanks for sharing your recipe and have a great weekend. This looks amazing!!!! I’m having a “Strawberry Linky” on my site, and would really like you to link this recipe up with it! Thanks for inviting me! I did!